Preheat your oven to 425 degrees F 220 C.
Wash the potatoes and place them in the oven for 1 hour or until fork tender. Remove the potatoes and allow them to cool completely. Cut the potatoes in half, spoon the flesh out, and place it into a bowl. Be sure not to spoon right to the skin. Add the milk, butter, garlic, salt, and pepper to the bowl. Mash the mixture together. Put in 2 strips of fried bacon, half the green onions, and mix it with a spoon. Spoon the mash back into the potato skins. Spread the grated cheese over the top. Lower the oven heat to 350 degrees F or 177 C and put the potatoes back in for an additional 3 minutes or until the cheese melts. Remove the potatoes from the oven and garnish them with the remaining bacon and spring onions. 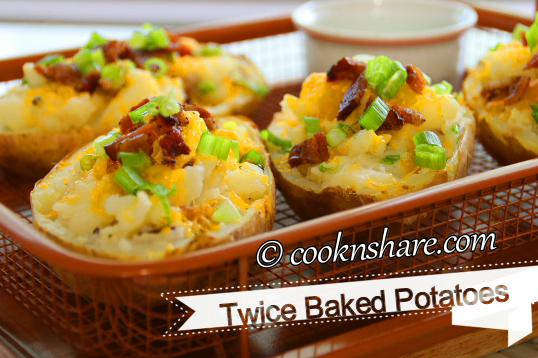 Serve and enjoy your creamy and cheesy twice baked potatoes.